Elementary Tagalog's comprehensive approach will help students master basic Tagalog (Filipino) without frustration. From learning to read Tagalog words and pronounce its sounds to using correct grammar, communicating in dialogues and building vocabulary, learners will be surprised at how quickly their skills in Tagalog language develop. The expert guidance in Elementary Tagalog is carefully sequenced to be the most effective and supportive for beginners and really helps students learn Tagalog. Covering a range of topics, the lessons center on themes from the family, the home, and the community to food, travel, health, leisure time, festivals and popular culture. There are plenty of exercises, activities and practice drills to help learners acquire and master the language fundamentals, while culture notes explore the diversity, heritage and history of the Philippines. 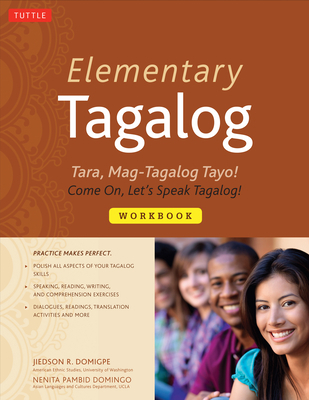 The Elementary Tagalog Workbook is a helpful companion to the textbook and will assist you in practicing and polishing your skills. Each lesson supplements the corresponding lesson in the textbook. There are ten activities per lesson, which offer a range of exercises and practice opportunities to enable you to achieve proficiency in everyday, conversational Tagalog. Jiedson Domigpe is a lecturer in the Department of American Ethnic Studies at the University of Washington, where he is also on the faculty of the Southeast Asian Center at the Henry M. Jackson School of International Studies. He has taught at several schools, including the University of California at Los Angeles and the Defense Language Institute and Foreign Service Institute, where he was nominated for the prestigious Cox Award for best teacher. He lives in Seattle, Washington. Nenita Pambid Domingo is the head of the Filipino Program in the South and Southeast Asian Languages and Cultures Program at the University of California at Los Angeles and a lecturer in the Asian Languages and Cultures Department. She lives in Los Angeles.